If you're like me, you probably like to make gifts for friends and family for the holidays. Last year most of the gifts I gave for Christmas were made by me. I have several friends that sew though, and was stumped about what to give them, when I know they could make the same things for themselves. This year, I've compiled a list of some really great gift ideas for "the girl who sews everything." I also thought it might be helpful for you to share with your friends and family who might be wondering what to get you! I also have a surprise, so keep reading! Adult coloring books are really trendy right now, and lucky for us: many fabric designers are coming out with their own coloring books! Connecting Threads has a whole section of coloring books, so you can add them to your thread order to save on shipping! Fabric bundles! It's so fun getting surprise fabric! Many shops, like Fabric Spark, offer monthly designer bundles, and also beautiful assorted bundles. Bag Bling! Often those extra finishing touches make our projects look much more professional. Emmaline Bags has the best quality hardware I've ever used. Any bling from there will be treasured. If you're looking for a large gift to give, how about a steam press? I personally don't have one (yet) but I hear they're such a big time saver for fusing interfacing and stabilizers. If your friend loves coffee almost as much as sewing, they'll love this special sewing mug! Connecting Threads has several quilty gift ideas to check out. I love my Thread Cutterz ring so much! I wrote a post about them here if you want to read more about them. I think they'd make a great stocking stuffer! Show the world you're crafty! I have several of these Swoon shirts, and wear them with pride. These thread sets from Connecting Threads are fabulous! I bet they'd even make adorable ornaments in a Christmas tree! How about some reading material? 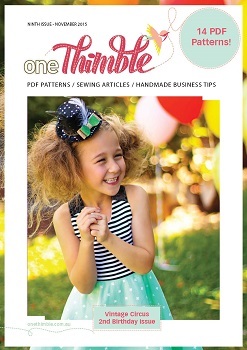 Gift a single issue or subscription to One Thimble, a digital sewing magazine, which includes articles, interviews, tutorials and PDF patterns, all in a convenient format for your tablet! Craftsy is loaded with great online classes! I recently took Sara Lawson's new class: Building Better Bags, and I'm really enjoying learning. Craftsy classes are so accessible and helpful. Stuff her stocking with little extras, like packages of piping. It's nice to have a variety on hand. Sitka Fabrics has a great assortment of colours at a great price. This has been on my wishlist for a very long time (hint, hint). The Silhouette Cameo does sooooo many things! From cutting paper, to vinyl, to fabric, it's a crafter's dream tool! Not sure which fabric to pick for her? Many shops, like Funky Monkey Fabrics, offer gift certificates. An embroidery kit is a nice change of pace for sewists, and Flare Fabrics has several to choose from. This owl one is my favourite. Sometimes it's fun to just pick up a project and not have to think too much about it, like having the fabric already picked for you. 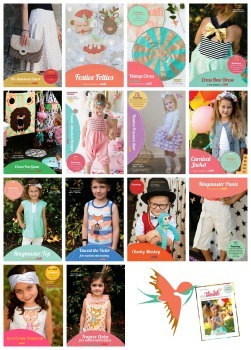 Craftsy offers dozens of sewing project kits which include a pattern and all the fabric needed for the project. You usually just need to add any interfacing and/or hardware. Check out the big selection of bags and other projects. SURPRISE! I'm giving away this Noodlehead Envelope Clutch Kit!! See below to enter. I love reading sewing books when I can't be at my machine. 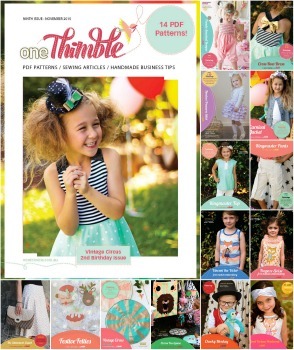 These are both by bloggers I follow and each offer tips for sewing, plus have exclusive patterns included in the book. A reliablefabric marker always comes in handy. Read more about fabric marker selection in this post. I love digital patterns, so of course I need to include them in this list. Surprise your friend with a fun new PDF, like this Sew Sweetness Crimson and Clover Train Case pattern. Finally, make her something! The gifts I've received made by fellow sewing friends are so treasured. As a maker myself, I know all the love that goes into it. This new Maker Tote from Noodlehead would be the perfect gift for a crafty friend. p.s. Don't forget to share this post with your friends and family so they know what to get you this year! Check out the Rafflecopter below to enter to win the Noodlehead Envelope Clutch Craftsy Kit. Open to US and Canadian residents. Once again, I'm amazed at all the awesomeness out there! Thank you so much to everyone who joined us in the Iris Sewalong. If you want a recap, check this post with links to each day and pattern (plus discount). I love the variety of bags from the same pattern! If you want to see more, check #HappyOkapiBlueCallaSAL on Instagram. Brinkley used those adorable Cotton + Steel sloths! I love the antique brass rings too! Thank you so much to Blue Calla and Funky Monkey Fabrics for the great prize! What did you think of the Sewalong? My next one will be a bit different, so stay tuned! As I was set to announce the winner of the Elixir Fat Quarter Bundle, I realized I haven't announced the winners of some other contests I've been a part of. Celine sent some pillowcases in right away, and also happened to be the random winner of a Tula Pink Pillowcase Kit from Fabric Spark. Thank you to everyone who sent in pillowcases! They were appreciated so very much. Pillowcases are accepted year round; right now there is a need for holiday themed pillowcases, as Ryan's Case for Smiles gears up for hospital stays over Christmastime. Please see my original post for more information about how you can help. You can also still purchase Pillowcase Kits from Fabric Spark! I really enjoyed reading all the comments about how everyone would use the bundle if they won. Of course many people said bags, but some mentioned pillows, or even a quilt! Congratulations to Marsha L! I'd love to see what you come up with. Thank you very much to my sponsor Stay Home Fabrics for offering up such a great prize! Didn't win this time? There's one more contest going on right now that is finishing soon: The Blue Calla Iris Sewalong! Check out this post for all the details, including a discount and how to participate. I'm also working on another giveaway happening very soon, so stay tuned for that!